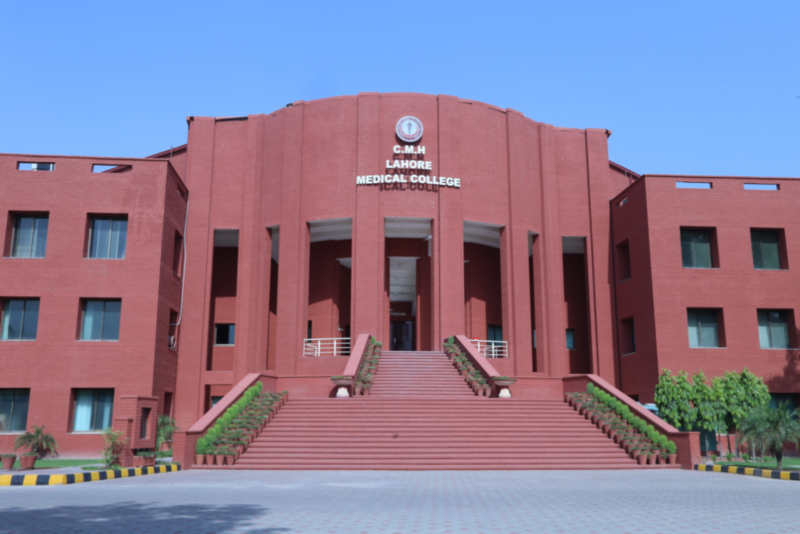 Located in the premises of Combined Military Hospital Lahore in the secure and serene environment of Lahore Cantonment, CMH Lahore Medical College has been providing students with the exceptional knowledge and practice, required in this fast paced world, since 2006. The campus offers well equipped, state-of-the-art Lecture rooms for each department. Along with that, it boasts a meritorious Anatomy dissection hall, tutorial rooms, laboratories, library, computer lab, auditorium, cafeteria, book shop, sports facilities and a spacious parking area. Pakistan Medical and Dental Council has granted recognition to CMH Lahore Medical College. CMH Lahore is affiliated for new admissions of MBBS / BDS with National University of Medical Sciences (NUMS) Rawalpindi. Government of Pakistan, Ministry of Health has approved the Institute of Dentistry CMH Lahore Medical College to impart training for BDS degree. World Health Organization has included the college in its World Directory of Medical Schools (WDMS). It is recognized for ECFMG and included in the list of Foundation for Advancement of International Medical Education and Research – FAIMER. The term Local Student means any person having Pakistani Nationality. – Foreign national and Pakistani having dual nationality / resident status. – Pakistani National student who has passed an examination equivalent to intermediate level of Pakistan from a Foreign University or Examination body or Foreign Education System. Sc. / qualification equivalent to F.Sc. from a foreign university or foreign education system with three science subjects out of which Biology and Chemistry are essential subjects with a minimum of 660/1100 i.e. 60% marks in aggregate (without marks of NCC or Hifz-e-Quran). The third subject can either be Physics or Mathematics. The equivalence of IBCC will be accepted in aggregate. There is no minimum or maximum age limit for admission in MBBS/BDS Course. Due to the peculiar nature and demand of the profession a candidate should possess adequate mental and physical health. If the medium of instruction two years prior to application for admission/entry test is not English the candidates will be required to present a valid TOEFL or IELTS with a minimum score of 500 or 5.5 respectively. A student who has availed four chances without clearing the first and second professional MBBS / first professional BDS exam and has been expelled on that account, shall NOT be eligible for continuation of medical/dental studies and shall NOT be eligible for fresh admission. As the course structure of F.Sc. is considered the requirement for a student to be able to enroll in CMH Lahore, anyone who has not studied the standard F.Sc. requires to present an equivalent to it. American High School Diploma and A level students should submit Equivalence Certificate of IBCC (Inter Board Committee of Chairmen) at the time of submission of the application form. No Equivalence Certificate will be accepted after the last date of submission of applications. A provisional certificate by IBCC is also acceptable for initial submission of application form. Acquiring the prospectus: After appearing in NUMS Entry Test, the applicant needs to purchase a prospectus of the college which comes with a unique ARN number. Admission forms of Applicants will not be processed without payment of the Price of Prospectus/ Admission Process fee. The college prospectus can be collected from College admission office or the Summit Bank, Day Building, Abdur Rehman Road, Lahore Cantt. The date /period for collection of prospectus will be advertised in nationwide newspapers and on college website. It will not be dispatched via mail / post / courier. There are separate prospectuses for MBBS and BDS courses and for foreign and local candidates in each course. An applicant, if eligible, can compete simultaneously on all the four categories i.e., MBBS Local, MBBS Foreign, BDS Local and BDS Foreign. However, in such case he / she will have to purchase separate prospectus for each category and separate application forms will be filled, using separate ARN from each prospectus. The price of Prospectus for both local and Foreign Students is Rs. 3000/-. Filling the application form: After the applicant has purchased a prospectus for the desired program / degree, with a unique ARN number, they can proceed to the Application Form. The Admission Application Form can be filled online at your own by following the instructions at college website or at the college admission office by yourself or with assistance of admission office staff for those who find difficulty in online submission. Acquiring the roll number slip: A Roll number will be issued to each student for identifying own merit position in merit list. Roll number slip can be printed online using your ARN after filling out all the columns of the application form and uploading 1 x color photo image in JPG format. Applicants finding difficulty in opening the online form or uploading the photo image are requested to approach college admission office for the needful. Confirmation of admission: Admission of the selected students will be confirmed only after they have deposited the college admission, tuition and other fees as prescribed, within specific days of announcement of the result. If a seat is not confirmed by due date, it will be offered to the next candidate on the merit list. Once a student is admitted in the college, his Matric, F.Sc, and other certificates will be verified from respective board by NUMS. If the documents are found incorrect, the admission will be cancelled and the fees/ dues will not be refunded. In case of students with same merit position, preference will be given to the student who will be older in age. Once the student is registered by the university in a category of local / foreign student MBBS/BDS, the category cannot be changed throughout the course. No amendment in the results/ data entered will be accepted after last date of submission of application. Results received after the closing date of submission of application will not be entertained. Roll number slip will not be sent by TCS/ Mail/ Post. The candidates competing for Army seats of W & R Directorate in MBBS / BDS course must show their father’s / mother’s identity documents at the college admission office in person before the deadline of filling of application forms in order to print the Roll No slip and to be considered on Army seat. 1 x passport size color photograph (latest). Photocopy of Matriculation or equivalent qualification with IBCC Equivalence certificate. Photocopy of F.Sc. or equivalent qualification with IBCC Equivalence certificate. Photocopy of latest NUMS entry test result. Photocopy of SAT-II result (if applicable). Photocopy of Father CNIC / Passport (whichever is applicable) for foreign students. Undertaking form (duly signed by the candidate and parent/guardian). Copy of income tax return of the previous year. Copy of passport of parent/guardian, as evidence to the educational institution that during previous tax year, his/her stay in Pakistan was less than one hundred eighty three days. A certificate that he/she has no Pakistani source of income. Candidates who qualify SAT-ll examination score with a minimum 550 marks in each of the three Science subjects, of which two have to be Biology and Chemistry, whereas third subject can be either physics or mathematics, are eligible to apply. Students seeking admission are encouraged to undertake SAT-II exam and NUMS entry test simultaneously. Merit calculation for admission will automatically utilize the higher marks either from NUMS Entry Test “or” SAT-II. However if at a later stage, the PM & DC / NUMS decides not to entertain SAT-ll exam scores for local students, the admission on local seats will be conducted on the basis of NUMS Entry test only. The validity of NUMS entry test is l x year, hence the NUMS entry test undertaken only during the admission year is acceptable. However the SAT-ll score are valid for 2 it years. Admission will be strictly on merit. Any student having incomplete results / academic documents on the closing date for admission application will not be considered for admission. Decision by the Selection Panel would be ﬁnal. In Case I’M & DC I NUMS issue any new additional admission criteria/instruction, the College admission policy will be governed by the PM & DC / NUMS admission regulations Prevalent on the date of admission. To stay on top or even survive in a medical college you need to stay up to date on everything. Managing time can be hard and a lot of work can go to waste, deadlines can be missed, marks can be lost and it can even affect your health if a proper schedule is not formed and followed. The minute the studying starts you need to start organizing your tasks according to their importance and impact. You can either make a schedule by hand or use applications available for this purpose which can even remind of tasks to be done. Never leave something on tomorrow, try to get every assignment/worksheet/homework you get as soon as possible. Keep a track of your classes, carefully read your college time table so that you don’t end up accidentally missing a lecture because you read the time table wrong (believe us, that happens). Once you are done with your school and then intermediate studies, do not expect things to run that smoothly from there onwards. Because you have to enter professional life after college, college is your trial where you learn how to deal with people around you and do most of your work on your own. Hence in college it will be your and only your job to make sure you’re on top of your work, your friends, teachers, or anyone else will not take the responsibility of making sure you understand everything and complete whatever work is required. Teachers will give lectures and that is probably all the formal education you will be getting, there will be no spoon feeding so you will have to add a lot of do-it-yourself to it. Research, practice, and ask questions. “Practice makes a man perfect ” it is said. Do not depend on lecturers to teach you every single thing; it is not even humanly possible for them to do so with such a high number of students. The point being, a lot of self-help will be involved in helping you achieve your goals. Just as no two human beings can ever be the same in their life experiences, no two students can have the same clinical experience. Your experience will be what you make of it. Keep in mind that whatever you learn is not to be forgotten. You are opting for a career that requires retention of this knowledge for a lifetime. To look at the short term aspects, what you learn will be there again in your finals, and again during residency when you start treating actual patients. So whatever you learn, make sure you understand it completely now, casual lookups are fine to jock up your memory when required but if you don’t understand the concept you will have to do it later on. Throughout your life, you will get to meet new and different people. Consider your life at this college as a training for that. Here too, you will meet different kind of people. You will have to learn how to assess a person; it will be for your own good. Avoid trouble and steer clear of bad influencers. Even if you end up having a bad experience with someone, do not get your hopes down, instead consider it a lesson. At the end we would like to assure you that there are always ups and downs in life. Don’t lose hope, keep our tips in mind and Good luck!